Leaving Stokes Hill wharf at 1745 hours a fast boat ride will take you past the sights and sounds of Darwin city seascape to arrive at Cullen Bay Beach where you will pick up your fish’n chips. 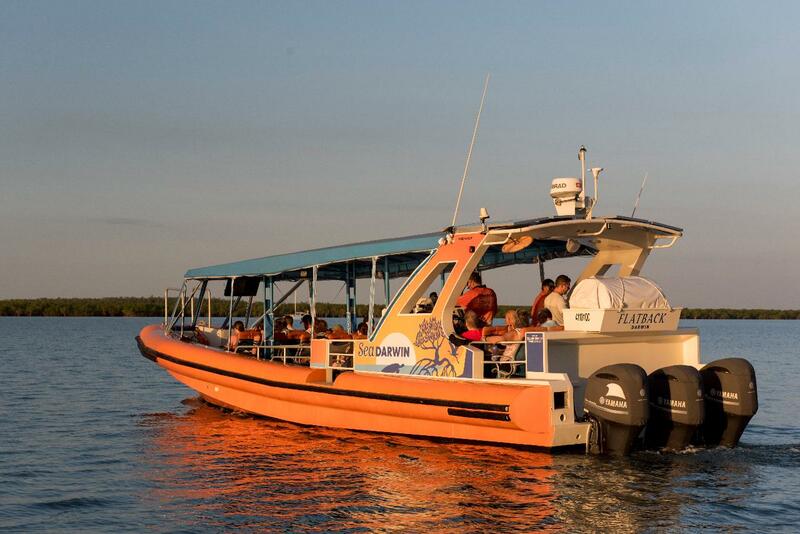 Eat your dinner accompanied by a glass of bubbly the warm wind, an exquisite tropical sunset and a harbour full of intrigue, as you casually cruise around to find the best position for your Darwin Harbour sunset photo. A perfect end to the day for families and spirited travellers, and those that have an interest in a real Top End experience. A fast boat ride in the calm of the evening will get you back to the hub bub of Stokes Hill Wharf. This award winning sunset cruise* is for those seeking a truly Territorian experience. * Sunset Fish'n Chips - Winner of the 2015 NT Brolga Excellence in Food Tourism Award.